Do you like to listen to songs on Apple Music? How do you get lyrics on Apple Music? It is an enjoyable thing to learn a piece of your favorite music by referring to the lyrics of it on Apple Music. You can not only check lyrics on Apple Music but also find music through lyrics as well on this platform to play back. Previously, the lyric websites were the first method that you could think up to get useful lyrics, but now you are able to obtain them from Apple Music directly when you are enjoying a song. This feature is really amazing. Now let’s begin to check out how to see lyrics on Apple Music. iPhone will be used as the example. 1.On iPhone, run Music app and then play back the music you desire to see lyrics. 2. Click on the music display box at the bottom of the interface to extend the music player to full window. 3. On the interface, swipe up to display the list of music. If the song has lyrics to show, you will view the "Lyrics" tab above "Up Next". Hit the "Show" button to check the song with lyrics. This solution to settle how to see lyrics in Apple Music is quite handy, but the precondition is that the music has lyrics to display on Apple Music app. 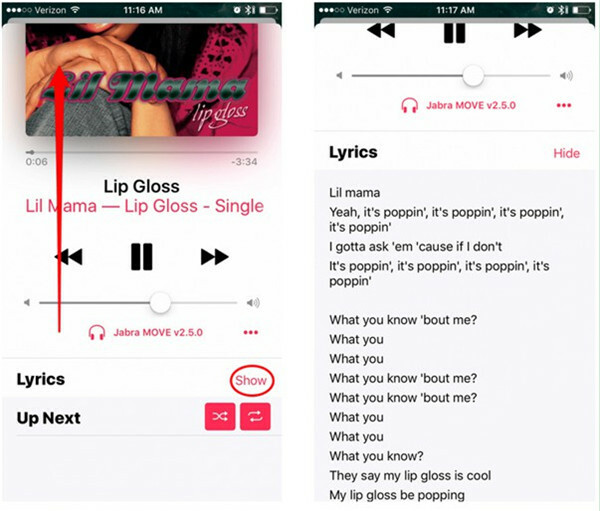 It is an easy task to handle how to show lyrics on iPhone Apple Music. If you also want to find a song in Apple Music only with lyrics, this part contains the content you need. To find a song without lyrics but with song name or artist is common. 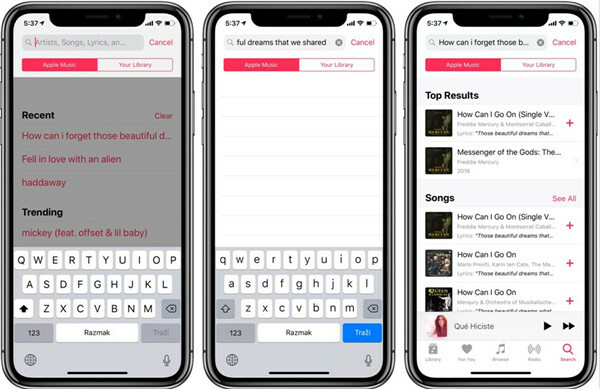 iOS 12 and later Apple systems have updated Apple Music and now you can simply type song lyric lines in the search bar to get the music you are looking for. Now you can follow along to know how to make it. 1. Launch Music app on iDevice and then click on the rightmost search icon at the bottom of the screen. 2. Type in a few lyric lines or words of the song you are fond of and then click on "Apple Music" or "Your Library" below the query to set scope for your searching results. 3. After that, you need to click on "Enter" key to run your query. If the song you want to search is new, make sure to click on "Apple Music" instead of "Your Library" option. In most cases, you can find the song on Apple Music. If you fail, you can try other methods to finish this task. iTunes is also known as one great place to enjoy songs with high quality. Sometimes, you want to manage iTunes music more conveniently or get iTunes music info back. 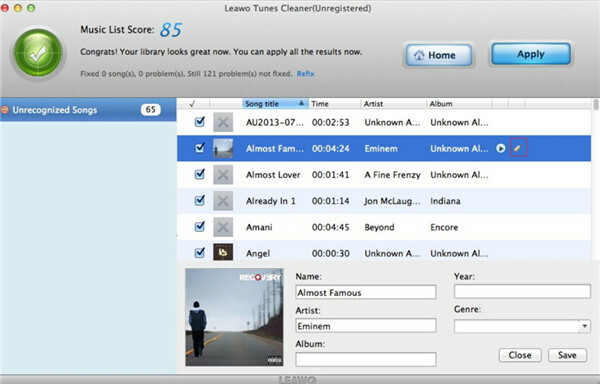 In this case, Leawo Tunes Cleaner for Mac will be helpful for you to realize iTunes organization goals. This iTunes library management tool ranks high among similar programs, which can play a significant role in fixing iTunes music info perfectly. The following contents will display you the steps to finish the task of getting iTunes music info back via this wonderful software. ☉ Manually edit music tags like artist, album, cover, genre, etc. 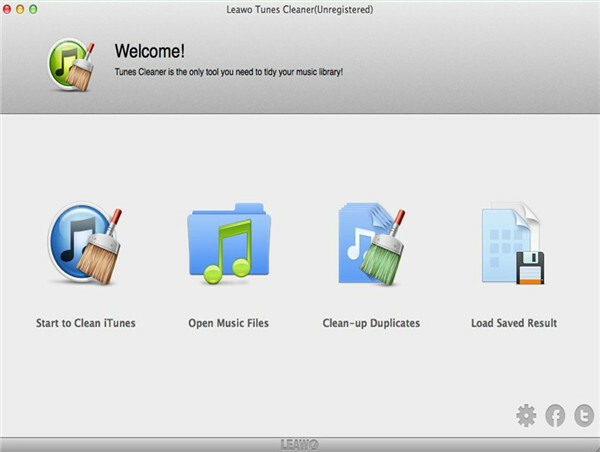 On computer, launch the program and then click on "Start to Clean iTunes" to enable the software to scan iTunes library automatically. You can also make use of "Open Music Files" choice to choose iTunes library files to scan. After the ending of the scanning procedure, the tool will display all songs with issues in 3 categories for you to fix: Songs Without Album Artwork, Songs Without Artist and Songs Without Album. You can see each file for fixing in the right part of the screen. Click on "Fix All" button to begin to find iTunes music info back. Hit "Apply" button after the automatic fixing is finished. If you have the demand to edit iTunes music info according to your own preferences, you can click on the edit button next to the playing icon of each song. Thus, you can make use of the editing panel to alter or add music tags as you like. Finally, hit "Apply" button to save your settings. This tool has helped me a lot. You can give it a go to know how wonderful this iTunes library management tool is. 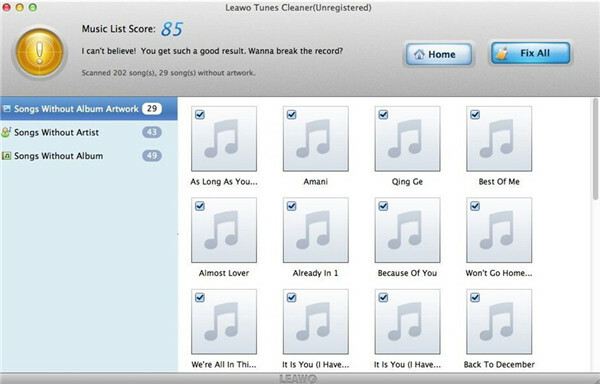 It is sensible for you to visit its official website to download the trial version and install on computer to use the steps shown above to fix your iTunes music info effectively. After you know its powerful functions practically, you can also update to the paid version to use more features of this software in daily life.